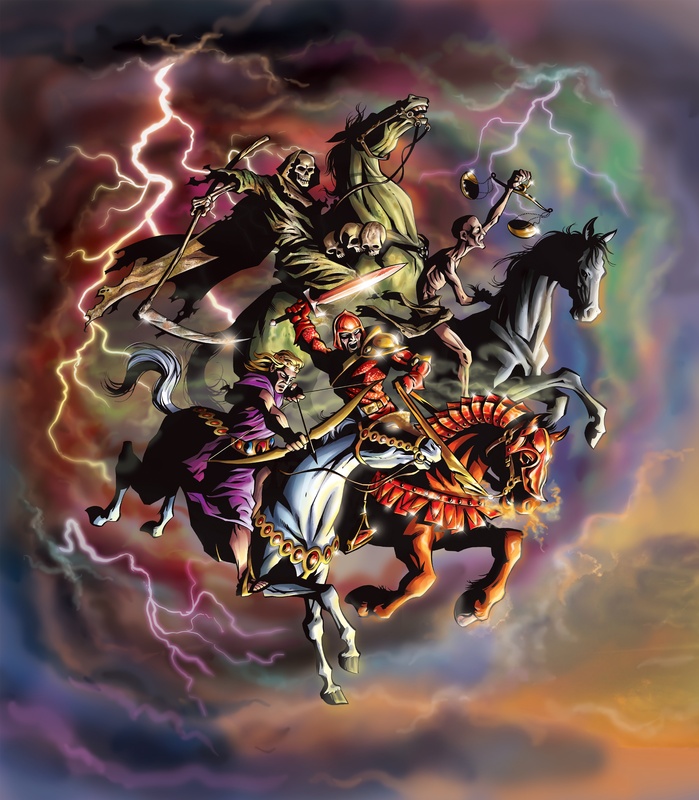 The "four horsemen of the Apocalypse"— this latter term being the Greek name for the book of Revelation—have intrigued Bible readers for centuries. What do they represent? The implications for mankind are staggering. In this first article of a series, we introduce the overall prophecy and look in detail at the first horseman. Christ uses four horsemen to represent the first four of seven seals He opens from the scroll in His hand. These images have intrigued generations of Bible scholars and students. Few sights are as stirring as a scene of horsemen galloping across a landscape. Moviemakers use such scenes to add drama, mystery and power to their stories. In Revelation 6, Christ uses four horsemen to represent the first four of seven seals He opens from the scroll in His hand. These images have intrigued generations of Bible scholars and students. Thundering across the prophetic landscape, these dramatic images cast a pall of terror on the world. What is their meaning for our troubled and uncertain world? Do these ominous riders foretell a coming wave of calamity for the earth’s inhabitants? Let’s look and see. To understand the seals in Revelation 6, we first need to examine chapter 5. John is experiencing a vision of the throne of God when he sees “in the right hand of Him who sat on the throne a scroll written inside and on the back, sealed with seven seals” (Revelation 5:1 Revelation 5:1And I saw in the right hand of him that sat on the throne a book written within and on the backside, sealed with seven seals. No one in heaven or earth is able or worthy to open the scroll and reveal its contents. John bemoans the absence of anyone capable of opening the scrolls. But a voice from one of the elders around the throne says: “Do not weep. Behold, the Lion of the tribe of Judah, the Root of David, has prevailed to open the scroll and to loose its seven seals” (Revelation 5:5 Revelation 5:5And one of the elders said to me, Weep not: behold, the Lion of the tribe of Juda, the Root of David, has prevailed to open the book, and to loose the seven seals thereof. What John saw next was the sight of the glorified Jesus Christ in the commanding position to receive and dispense the full power of God. “And I looked, and behold, in the midst of the throne … stood a Lamb as though it had been slain … Then He came and took the scroll out of the right hand of Him who sat on the throne” (Revelation 5:6-7 Revelation 5:6-7 6 And I beheld, and, see, in the middle of the throne and of the four beasts, and in the middle of the elders, stood a Lamb as it had been slain, having seven horns and seven eyes, which are the seven Spirits of God sent forth into all the earth. 7 And he came and took the book out of the right hand of him that sat on the throne. What follows from this awesome scene of angelic praise is the stirring anthem to Christ’s role in the plan of God. The four living creatures and 24 elders sing a new song. “You are worthy to take the scroll, and to open its seals,” they proclaim in unison. To this scene is now added the voice of many angels, perhaps numbering into the hundreds of millions, all loudly proclaiming, “Worthy is the Lamb who was slain to receive power and riches and wisdom, and strength and honor and glory and blessing!” (Revelation 5:11-12 Revelation 5:11-12 11 And I beheld, and I heard the voice of many angels round about the throne and the beasts and the elders: and the number of them was ten thousand times ten thousand, and thousands of thousands; 12 Saying with a loud voice, Worthy is the Lamb that was slain to receive power, and riches, and wisdom, and strength, and honor, and glory, and blessing. Such is the scene that stands as a prelude to the opening of the seals. The fate of mankind rests in God’s hands, and His patience is at an end. Christ alone is pronounced worthy to open the seals that announce God’s judgments on the nations. The destiny of humanity is not a matter of chance or whim, but has been spelled out in the seals that He opens. American King James Version×), elsewhere called “the Day of the Lord.” Notice how the prophet Joel described this period: “The sun shall be turned into darkness, and the moon into blood, before the coming of the great and awesome day of the LORD” (Joel 2:31 Joel 2:31The sun shall be turned into darkness, and the moon into blood, before the great and terrible day of the LORD come. The Day of the Lord begins with God’s intervention in world affairs to spare human life during a period of unparalleled global conflict and catastrophe. Mankind has suffered for centuries from the combined impact of war, famine and disease, but no previous period of turmoil will compare to this age-ending storm described in Revelation. When the seals open before John, he sees the first four uniquely pictured. Four ominous horsemen arise in an eerie sequence. To better understand what these horsemen represent, let’s look at another key prophecy Jesus Christ gave during His ministry. Jesus’ disciples were visiting Jerusalem with Him. After admiring the temple’s buildings, they crossed the Kidron Valley, climbed the Mount of Olives and paused to ask Christ for signs of His coming and the end of the age (Matthew 24:1-3 Matthew 24:1-3 1 And Jesus went out, and departed from the temple: and his disciples came to him for to show him the buildings of the temple. 2 And Jesus said to them, See you not all these things? truly I say to you, There shall not be left here one stone on another, that shall not be thrown down. 3 And as he sat on the mount of Olives, the disciples came to him privately, saying, Tell us, when shall these things be? and what shall be the sign of your coming, and of the end of the world? Jesus gave four signs that correspond with the first four seals of Revelation 6: “Take heed that no man deceive you. For many shall come in my name , saying, I am Christ; and shall deceive many. And ye shall hear of wars and rumours of wars: see that ye be not troubled: for all these things must come to pass, but the end is not yet. For nation shall rise against nation, and kingdom against kingdom: and there shall be famines, and pestilences, and earthquakes, in diverse places. All these are the beginning of sorrows” (Matthew 24:4-8 Matthew 24:4-8 4 And Jesus answered and said to them, Take heed that no man deceive you. 5 For many shall come in my name, saying, I am Christ; and shall deceive many. 6 And you shall hear of wars and rumors of wars: see that you be not troubled: for all these things must come to pass, but the end is not yet. 7 For nation shall rise against nation, and kingdom against kingdom: and there shall be famines, and pestilences, and earthquakes, in divers places. 8 All these are the beginning of sorrows. American King James Version×, King James Version, emphasis added throughout). Here Jesus reveals an overview of trends and conditions from the first century until the end of the age. Take note of the four significant developments He foretold: Religious deception, war, famine and disease. As this and later articles in this series will show, humanity has long suffered from the effects of these four signs. But nothing in history will compare to the catastrophes unleashed at the opening of the seals by the Lamb. The unprecedented devastation brought by the opening of the four seals will set the stage for the return of Christ as King of Kings. Let’s now look more closely at what John saw. As the first seal opens, John writes the following: “Now I saw when the Lamb opened one of the seals; and I heard one of the four living creatures saying with a voice like thunder, ‘Come and see.’ And I looked, and behold, a white horse. He who sat on it had a bow; and a crown was given to him, and he went out conquering and to conquer” (Revelation 6:1-2 Revelation 6:1-2 1 And I saw when the Lamb opened one of the seals, and I heard, as it were the noise of thunder, one of the four beasts saying, Come and see. 2 And I saw, and behold a white horse: and he that sat on him had a bow; and a crown was given to him: and he went forth conquering, and to conquer. White is a symbol of purity and peace. Here is a rider who appears to come in the name of and bearing a message of peace. But he is a conqueror, one who imposes his version of peace on the world. Possibly this rider will even bring about a pseudo peace, a condition described by the apostle Paul in 1 Thessalonians 5:3 1 Thessalonians 5:3For when they shall say, Peace and safety; then sudden destruction comes on them, as travail on a woman with child; and they shall not escape. Some confuse this rider with Jesus Christ, whom Revelation 19 shows riding a white horse at His second coming. But a careful examination reveals important distinctions. Christ is wearing “many crowns” at His return, not just a single crown as worn by this first horseman. And instead of wielding a bow, Christ is brandishing a sword with which He strikes the nations. To be consistent with Christ’s statements in Matthew 24, we must conclude that this rider represents not Jesus, but instead false teachers who appropriate His name while corrupting His plain teaching and leading many into destructive heresy. Remember His warning: “Take heed that no one deceives you. For many will come in My name … and will deceive many” (Matthew 24:4-5 Matthew 24:4-5 4 And Jesus answered and said to them, Take heed that no man deceive you. 5 For many shall come in my name, saying, I am Christ; and shall deceive many. American King James Version×) to invade the Church, causing division and confusion. The apostles were forced to deal with this problem, as evidenced by their writings to the Church. Paul warned the elders of the congregation at Ephesus to beware of false teachers: “Therefore take heed to yourselves and to all the flock, among which the Holy Spirit has made you overseers, to shepherd the church of God which He purchased with His own blood. For I know this, that after my departure savage wolves will come in among you, not sparing the flock. Also from among yourselves men will rise up, speaking perverse things, to draw away the disciples after themselves” (Acts 20:28-30 Acts 20:28-30 28 Take heed therefore to yourselves, and to all the flock, over the which the Holy Ghost has made you overseers, to feed the church of God, which he has purchased with his own blood. 29 For I know this, that after my departing shall grievous wolves enter in among you, not sparing the flock. 30 Also of your own selves shall men arise, speaking perverse things, to draw away disciples after them. As the apostle Peter neared the end of his life, God compelled him to give a stern warning about the apostasy that he saw looming on the horizon. The second chapter of his second epistle is a powerful rebuke of those who would bring false teaching into the Church: “But there were also false prophets among the people, even as there will be false teachers among you, who will secretly bring in destructive heresies, even denying the Lord who bought them, and bring on themselves swift destruction” (2 Peter 2:1 2 Peter 2:1But there were false prophets also among the people, even as there shall be false teachers among you, who privately shall bring in damnable heresies, even denying the Lord that bought them, and bring on themselves swift destruction. He went on to say, “Many will follow their destructive ways, because of whom the way of truth will be blasphemed” (2 Peter 2:2 2 Peter 2:2And many shall follow their pernicious ways; by reason of whom the way of truth shall be evil spoken of. American King James Version×). Peter calls the Church’s doctrine the “way of truth.” It is like a trail of truth along which the faithful have always walked. Christ called it a narrow and difficult way that few find (Matthew 7:13-14 Matthew 7:13-14 13 Enter you in at the strait gate: for wide is the gate, and broad is the way, that leads to destruction, and many there be which go in thereat: 14 Because strait is the gate, and narrow is the way, which leads to life, and few there be that find it. Near the end of the first century the apostle John, last of the original 12 apostles, saw a rapid escalation in the heresy and persecution that was plaguing the Church. During the reign of Roman Emperor Domitian a virulent strain of antagonism was unleashed on Christians. For a time, the government even exiled the aged apostle to the Aegean island of Patmos. It was there that he received the book of Revelation in vision. The three epistles bearing his name reveal the mounting tension in the churches and John’s desire to warn the members of the devastating impact of false teaching. He wrote of their individual and collective responsibility to examine those teachers who presented themselves as spiritual guides and experts. He knew it was easy to claim divine authority and thereby deceive people into following ideas that were spiritually destructive. “Beloved, do not believe every spirit, but test the spirits, whether they are of God; because many false prophets have gone out into the world” (1 John 4:1 1 John 4:1Beloved, believe not every spirit, but try the spirits whether they are of God: because many false prophets are gone out into the world. We see the apostles warning of the corruption of the true faith brought by Jesus Christ. Jude summed it up perfectly when he wrote of the need to “ contend earnestly for the faith which was once for all delivered to the saints” (Jude 1:3 Jude 1:3Beloved, when I gave all diligence to write to you of the common salvation, it was needful for me to write to you, and exhort you that you should earnestly contend for the faith which was once delivered to the saints. From the teachings of these corrupters evolved a church bearing Jesus’ name, but vastly different in doctrines and practices from the Church we see in the New Testament. In fact, two vastly different “Christian” faiths were now locked in a struggle—the true followers of Jesus’ teachings and the tarnished followers of a spiritually corrupt, counterfeit Christianity! Over the centuries, persecution from the Roman authorities took its toll. This counterfeit church further compromised the faith under threat of death from the state. Roman Emperor Constantine combined the power of the state with the ecclesiastical structure and authority of the false church. This created a union of church and state with the ability to create order by squelching dissent. Thus, Constantine and succeeding Roman emperors allied themselves with a deceptive religious system represented by the symbolic white horse of peace. Their mission was to conquer, in the name of Christ, all those who opposed them. Christ’s prophecy of false teachers coming in His name, claiming He is the Christ but deceiving many, indeed came to pass. Church history is largely a story of teachings and practices of the counterfeit Christianity, with its system of beliefs and practices fundamentally different from what the early New Testament Church believed and taught. The story of those who held to or at times recaptured the essence of true Christianity is not easy to follow through history. Today those who strive to practice the teachings that Christ put into His Church are few in comparison to the thousands of churches that call themselves Christian but are in fact descendants of the counterfeit movement begun in the first century. Christ said that “wide is the gate and broad is the way that leads to destruction, and there are many who go in by it … Narrow is the gate and difficult is the way which leads to life, and there are few who find it” (Matthew 7:13-14 Matthew 7:13-14 13 Enter you in at the strait gate: for wide is the gate, and broad is the way, that leads to destruction, and many there be which go in thereat: 14 Because strait is the gate, and narrow is the way, which leads to life, and few there be that find it. Yet even for these few, there is danger from a coming deception—Satan’s end-time effort to defeat and enslave humankind. Christ’s Olivet prophecy progresses, in concert with the book of Revelation, toward the final events before His return. He said, “For false christs and false prophets will rise and show great signs and wonders to deceive, if possible, even the elect” (Matthew 24:24 Matthew 24:24For there shall arise false Christs, and false prophets, and shall show great signs and wonders; so that, if it were possible, they shall deceive the very elect. American King James Version×). Even the elect, the people of God who “keep the commandments of God and have the testimony of Jesus Christ” (Revelation 12:17 Revelation 12:17And the dragon was wroth with the woman, and went to make war with the remnant of her seed, which keep the commandments of God, and have the testimony of Jesus Christ. American King James Version×), will be susceptible to this great deception. The apostle Paul spoke of this time of deception in 2 Thessalonians 2. This prophecy of a “man of sin” to arise before Christ’s return stands out within Paul’s writings. This “son of perdition” matches the description of the figure described in Revelation 13 as a “beast,” one of two beasts in this section, this one with two horns like a lamb and speaking like a dragon (Revelation 13:11 Revelation 13:11And I beheld another beast coming up out of the earth; and he had two horns like a lamb, and he spoke as a dragon. This person acts in tandem with the first beast (Revelation 13:1 Revelation 13:1And I stood on the sand of the sea, and saw a beast rise up out of the sea, having seven heads and ten horns, and on his horns ten crowns, and on his heads the name of blasphemy. American King James Version×), actually causing people to worship the first beast with great adulation (Revelation 13:12 Revelation 13:12And he excercises all the power of the first beast before him, and causes the earth and them which dwell therein to worship the first beast, whose deadly wound was healed. American King James Version×). “He performs great signs, so that he even makes fire come down from heaven on the earth in the sight of men. And he deceives those who dwell on the earth by those signs which he was granted to do in the sight of the beast, telling those who dwell on the earth to make an image to the beast who was wounded by the sword and lived” (Revelation 13:13-14 Revelation 13:13-14 13 And he does great wonders, so that he makes fire come down from heaven on the earth in the sight of men, 14 And deceives them that dwell on the earth by the means of those miracles which he had power to do in the sight of the beast; saying to them that dwell on the earth, that they should make an image to the beast, which had the wound by a sword, and did live. What is this talking about? Here we find the description of Satan’s final attempt to engineer a system based on his lying words of deceit and confusion. That it involves false religion is obvious from all the markers we have seen in the New Testament Scriptures. A man claiming to be God, in the temple of God, performs signs with the intent of persuading men to worship a system that appears to be doing good for the world. This is the final resurgence of a system God calls “MYSTERY, BABYLON THE GREAT, THE MOTHER OF HARLOTS AND OF THE ABOMINATIONS OF THE EARTH ” (Revelation 17:5 Revelation 17:5And on her forehead was a name written, MYSTERY, BABYLON THE GREAT, THE MOTHER OF HARLOTS AND ABOMINATIONS OF THE EARTH. His allure will likely lie in bringing about a peaceful solution to a world crisis where no one else has succeeded. The world will wonder in amazement at the ability of this system to impose a “peace” that will seemingly bring security in which the world can prosper economically. It will be a global system unlike any previous system, and it will seem to work. The ride of the first horseman, false religion, will greatly impact the nations in the last days. It will mark the expansion of a religious movement without parallel in history. Religion continues to be a powerful force among the nations. A great wave of religious change is moving continually throughout the world. Not only are the large world religions, such as Christianity, Islam, Judaism and Buddhism, growing and changing, but countless other new faiths are springing up, almost on a daily basis. Scholars who keep track of the world religious scene identify more than 9,900 distinctive religions. Despite predictions at one time that religion would become extinct, it continues to grow, reinventing itself after the personal interests and whims of people. False religion marches on at the same time that the world’s citizens are desperately in need of hope and solutions for survival. Their desperation provides fertile ground for religious extremism. The rise of fundamentalist Islam has precipitated a cultural clash that could lead to dramatic changes in the world geopolitical structure. Religious-based terrorism has implicated this major religion in a radical movement that will drag others, including Christian-professing nations, into a clash of civilizations—one that could possibly trigger the age-ending crisis foretold by Jesus Christ. Christ spoke of false religion as the precursor to “wars and rumors of wars.” The second seal of Revelation 6 is a rider on a red horse described as taking peace from the earth. Religious strife has often been the cause of war. We will see the connection between the two as we look at the ride of this next horseman. Just food for thought the 4th horse since it is green not pale. Could that mean the Muslim faith is represented here killing by sword green is the Muslim color.